The dental implants and cosmetic dental procedures used by most dentists and cosmetic dentists are root-form implants; which basically means that they are a replacement, or substitute tooth roots, used to replace natural tooth roots in areas of the mouth where teeth are missing. Since dental implants replace the tooth root, they create the stability needed to maintain your jawbone and have much stronger teeth that stay in place and don’t move around. If you need to have a dental implant procedure done in Mississauga, we encourage you to consider the professional team at Periodontal Associates. Read on for more information about dental implants, and how this cosmetic dental procedure can benefit you. 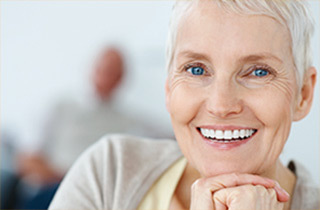 Dental Implants in the Mississauga area have the capability to assist you with looking and feeling younger because they prevent bone loss that would normally occur with the loss of your teeth. By preventing bone loss that would normally occur with the loss of teeth, your facial structures remain normal and intact. The chances of wrinkling and looking older than you are are less likely if your jaw bone stays intact and does not deteriorate. When your replacement teeth look, feel, and function like real teeth, you will experience improved self-confidence. Enjoy a brand new smile, laugh more freely, and enjoy conversing with others again! Most of our patients love their new implants, because of their improved appearance, function, comfort, and health. When you go out in public, you will never have to cover your mouth with your hand or put off eating out of fear of a denture popping out. By replacing the entire tooth, as well as the tooth root, it is possible to more closely replicate the function of natural teeth than with dentures, with a strong, stable foundation that allows comfortable biting and chewing. Also, nothing in the in the mouth looks or feels false or artificial like complete dentures! Bring out the best in your smile with cosmetic dentistry in Mississauga. Periodontal Associates offers a number of cosmetic and restorative dental procedures to help your smile feel and look its best. For many patients, nothing is more attractive than a healthy, confident smile. Cosmetic dentistry can help improve your teeth’s appearance in a number of ways including changing the shape, size, realigning bite and positioning; or replacing missing teeth. All of our surgical, and non-surgical, cosmetic dental services are provided with the goal of giving you the smile you’re looking for while being educated on any consequences of going through the procedure itself. For more information about dental implants or cosmetic dentistry in Mississauga, please feel free to continue browsing through our website. We can be reached at 647-360-8590 or by filling out our contact form. Our office is located at 4295 Village Centre Ct, in Mississauga.